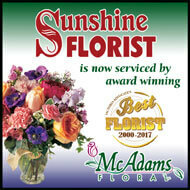 McAdams Floral is committed to protecting our customers' privacy. 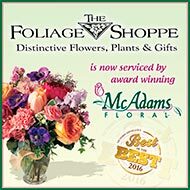 We feel it is important that you fully understand the terms and conditions under which we use the information we gather from you through your use of our website (http://www.McAdamsFloral.com). We will never share your personal information with anyone except as described in this policy. Changes to this policy will be announced on our website at least ten days in advance, so please check back periodically. We collect information that helps us know the specifics of who you are. Personal information is requested when you register with us, order a product or service, fill out surveys, correspond with us, or otherwise volunteer information. If you order one of our products, we will collect and maintain your name, email address, mailing address, telephone number, product selections, credit card number (or check or money order information if using such payment methods while ordering via mail), order number, as well as the recipient's name, address and telephone number, if different than yours. We collect this so that we can fill your order, communicate with you (or the recipient) about your order, and so that we can send you promotional materials. Before confirming your order, you will have the opportunity to review the product order form and make changes and additions to the information it contains. With this information, we can fill your product orders and better provide you with personalized services. Our primary goal in collecting personal information is to provide our visitors with a superior customized online experience. We may perform statistical analyses of aggregate customer behavior. This allows us to measure relative customer interest in the various areas of our website for product development purposes. Any information we collect is used for our own internal purposes to improve the content and navigation of our website, to enhance users' experiences when visiting our website, to customize the content and/or layout of our pages. We also use information to notify consumers about updates to our website, to complete user-initiated transactions, to trace false orders and to contact customers for marketing purposes. If you contact us by telephone, email or letter, we keep a record of your contact information, correspondence or comments. If you report a problem with our website, we may collect such information in a file specific to you. If you provide us feedback through our website, by email or by calling us, we may ask for your name and email address in order to send you a reply. The information collected by our website is used to process orders, to keep you informed about your order status, to notify you of products or special offers that may be of interest to you, and for statistical purposes for improving our website. We will disclose your personal information to third parties to charge your credit card (or process your check or money order, as appropriate), fill your order, deliver your order and deliver promotional emails to you from us. We do not sell, trade or rent your personal information to others. From time to time we are contacted by gift recipients who ask us who the sender was. If we receive a request from a recipient asking who sent flowers, we will give the name on the gift message accompanying the flowers. If there is no gift message filled out or if there is no name on the gift message, we will contact the sender via email. If we receive approval to disclose the sender's name from the sender via email or in writing, we will then inform the recipient. If the sender does not reply via email or in writing, or if the sender denies permission, then we will not reveal the sender's identity to the recipient.